Welcome to our Wine and Recipe Party! Hi, I’m Bob Warfield. 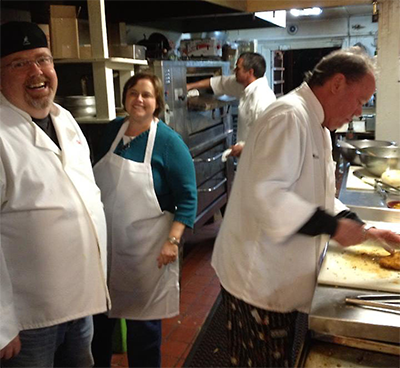 That’s me on the left in the photo, my wife’s in the middle, and my close friend Chef Michael Clark is on the right. Never mind my profile–you can’t trust a skinny chef’s recipes. We’re all cooking at his restaurant “Michael’s on Main” in Santa Cruz, California. He’s since sold that establishment, but we still enjoy cooking together frequently. I’m a career entrepreneur with 7 companies under my belt.If you’re wondering what else I’m up to, I run two other blogs. BobWarfield.com is my entrepreneurship blog. CNCCookbook.com is my Day Job. I make software for CNC (robot) machine tools. I’m also a consummate Foodie and I love to cook. I’ve been at it since I surprised my family by sneaking down early in the morning and making French Toast at the age of 6. Chef Michael became my cooking mentor after inviting me to be a Guest Chef at his restaurant. We’ve been fast friends ever since. Imagine what it would mean to your cooking if you had a world-class chef looking over your shoulder and making suggestions? That’s what it’s been like for me cooking with Michael, and we decided to try to bring that experience to you via this blog. Chef Michael has probably forgotten more about cooking than most of us will ever know. He’s cooked for the likes of Jackie Kennedy (with Secret Service peering over his shoulder), he’s owned restaurants and catering services, he has cooked for leading Silicon Valley Executives like Andy Grove and Gordon Moore, and he’s taught others to be Chefs at Hartnell and Cabrillo Colleges. Michael started as an apprentice cook at the fabulous Savoy Hotel in London, which holds an amazing place in Culinary History. His is a long and distinguished career (nowhere near over), and I just love listening to his great stories to tell. But best of all, I love sharing his passion for great food and cooking. Chef Michael is down to Earth. He agrees with Anthony Bourdaine’s conclusion that Chefs are basically like pirates leading lusty lives. Yo, ho, ho, it’s the Chef’s life for us! So please join us on your own Culinary Journey. We hope you enjoy our many articles and tips. Feel free to write with any feedback at all. I’m easy to reach via email.